Pennsylvania’s 18th Congressional District, southwest of Pittsburgh. 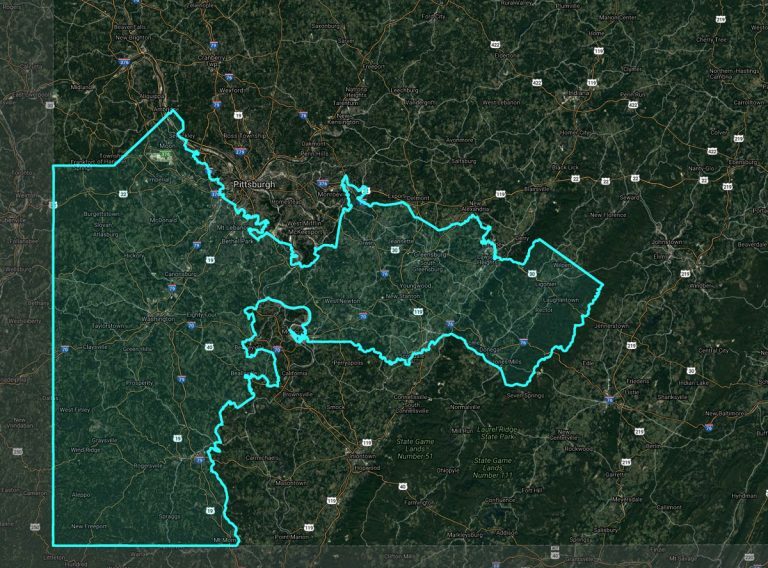 KEYSTONE CROSSROADS: Pennsylvania’s upcoming congressional elections are in flux after the Pa. Supreme Court ruled this week that the state’s congressional map is unconstitutional. Things are especially complicated in the 18th Congressional District south of Pittsburgh. Pennsylvania state Rep. Rick Saccone, a Republican, and attorney Conor Lamb, a Democrat, are running in a special election on March 13 to complete the rest of former Republican Congressman Tim Murphy’s term in office. That contest will use the existing district boundaries. But, if they want to run for the next full term, they might soon need to adjust to new political terrain. On Monday, the Pennsylvania Supreme Court ordered the state legislature to draw new congressional districts before the primary election on May 15. It found that existing lines violate the state constitution after a group of Democratic voters challenged the current map as an illegal partisan gerrymander designed to favor Republicans. But, it’s not clear whether a new map in the primary would benefit first-time Democratic candidate Lamb, said Sandi DiMola, a political science professor at Carlow University. As a newcomer, DiMola predicted Lamb could have a hard time pivoting to a new version of Pennsylvania’s 18th Congressional District if it includes new territory where’s he’s unfamiliar to voters. Since Saccone has already run for office and won, she said, he’s likely to have greater name recognition that can carry into new areas. Monday’s ruling will not affect the March 13 special election. On Tuesday, Republicans in the General Assembly requested a stay from the state Supreme Court, which could delay the timing of any map changes. Regardless of who wins the special election, candidates in the 18th District must run in the May primary in order to serve the following two years. Experts expect Lamb and Saccone to seek their respective party’s nomination in the primary. In an opinion released Monday, Pa. Supreme Court Justice Max Baer, elected as a Democrat, agreed with the majority that the map is unconstitutional, but dissented in the court’s decision to compel state government to produce a new map in time for the 2018 primary elections. Bear specifically cited the 18th Congressional District in his reasoning. “I find the likelihood for confusion, if not chaos, militates strongly against my colleagues’ admittedly admirable effort to correct the current map prior to the May 15, 2018 primary election,” wrote Baer.